A few months ago I posted about a purported lost manuscript of John Kennedy Toole, the late author of A Confederacy of Dunces. Since that time a small archive of Toole manuscript material did come to light and went under the hammer at Sotheby's. It included an autograph letter signed by Toole, a first edition of Dunces and children's books from his own library. I happened to be on the phone with a representative from Sotheby's on June 15 when this lot was auctioned in their New York rooms and, despite the fanfare surrounded it and the estimate of $10,000 to $15,000, it sold for the low estimate of $10,000. 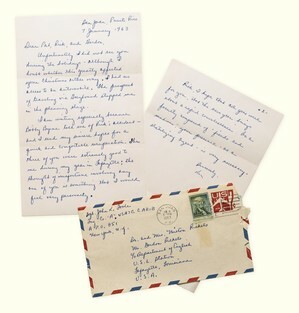 The 1963 letter, while on the surface appearing slightly mundane, bears traces of Ignatius J. Reilly. Toole writes, "Unfortunately I did not see you during the holidays – although I doubt whether this greatly affected your Christmas either way. I had no access to an automobile. The prospect of traveling via Greyhound stopped me in the planning stage…"
Are there more letters of Toole out there in attics and libraries? Only time will tell. Meanwhile, fans who still lament the tragically early passing of the author yearn for more words from his pen.